Allstar Jam/Jazz group The Mu'tet, headed by former Flecktones and Dave Matthews Band member, Jeff Coffin are playing Quixote's True Blue in Denver on Saturday, July 16th. The evening will also include music from Sam Holt & Friends and more! Come on out for an incredible night of music! The Mu’tet is led by 3x Grammy winning saxophonist & composer Jeff Coffin. On tour with Dave Matthews Band since July, 2008 and with Bela Fleck & the Flecktones since 1997, Coffin strives to expand himself, his band mates and listeners with music flavored by his wide musical interests. Drawing from African, New Orleans, Indian, funk, jazz, folk, Gypsy, rock, fusion, Brazilian and other styles of music, Coffin sends shockwaves down people’s spines with his fierce soloing and inspiring compositions. A passionate and curious player, Coffin is known to use guitar effects on his sax as well as sometimes playing two, count ‘em…two, saxes at the same time! On drums is the legendary Jeff “Apt. Q-258” Sipe. 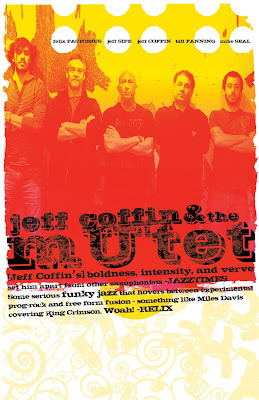 Jeff & Jeff have been playing together for many years and Sipe recorded on the Mu’tet cd BLOOM as well as the ‘DUET’ project with Coffin (Compass Records). He is renowned for his mind bending drumming with the Aquarium Rescue Unit, Trey Anastasio, Susan Tedeschi, Greg Osby, Phil Lesh, Project Z, Jonas Hellborg & Shawn Lane, Leftover Salmon, Alex Machacek, The Jimmy Herring Project, and many, many others. When Jeff Sipe unleashes his whirlwind of rhythms and grooves they have to be seen and, especially, heard to be believed. Felix Pastorius, son of bass great Jaco Pastorius, roots the Mu’tet on electric bass. He has been playing with the group since 2002 and is featured on MUTOPIA. Felix has also been touring recently with legendary jazz drummer Cindy Blackman while living and playing in NYC. At 6’ 6” tall, Felix is a gifted composer and a monster bassist with the chops and sensitivity of someone twice his height. Bill "the Spaceman" Fanning rounds out the horns on trumpet. Bill has performed with Bela Fleck & the Flecktones, the Mu'tet, Glenn Frye (of the Eagles), George Garzone, Jon Faddis, Maria Schneider and George Russell. In 2005, Coffin produced Bill's debut CD, "Parakletos". A brilliant improvisor and musician, Bill is stretching the boundries of the trumpet by using guitar pedals while still rooting his technique, concept, and sound in the masters. Mike Seal is a "Young Lion" of the guitar world. He sets people back in their seats with his burning lines, stunning ideas and a remarkable tone that defies his 25 years on the planet. You might hear a little John Scofield, Jimi Hendrix, Derek Trucks, Tony Rice, Stevie Ray Vaughn, or Lionel Loueke, but you’re always hearing Mike Seal. Listen up, he’s the real deal.